In the Jandari, where Kalimar’s wealthy sought the pleasures of the night, Ramagar preyed upon their purses. From a single game of jackals and hounds, the scimitar was his. Golden and bejeweled, Ramagar, the thief of thieves had acquired the ultimate treasure. But such a mysterious bounty would lead Ramagar and his lover, the beautiful dancer Mariana, on a dangerous journey to a cold Northern land beyond Kalimar which was shrouded in evil. 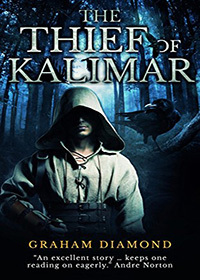 The Thief of Kalimar is an epic adventure in a speculative fantasy world, filed with danger, mystery and fantasy – you won’t be able to put it down.